Nothing is more painful than losing a close friend or loved one, and many people need time following a death to grieve for the loss. Unfortunately the funeral process often cannot wait, and can cause stress for families and friends who are mourning a recent loss. While many people probably know that burial or cremation are part of this process, there are a lot of other important procedures that must be done fairly quickly after someone passes away. The body must be prepared for viewing and burial, the death certificate needs to be filed as soon as possible, final tax returns must be filed, and you will want to review and execute the will (if one exists), and close financial accounts. Without the necessary assistance, these matters may rob you of your precious time to properly honor the deceased as you say goodbye. 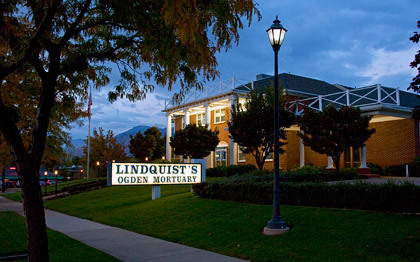 The details of the funeral are the last thing you have to worry about with Lindquist's Mortuaries and Cemeteries. As the most established mortuary in Ogden, you can lean on us to handle the details so you know everything will be done right. Our funeral home in Ogden offers a comprehensive range of solutions to accommodate all your memorial wishes. We can review all the options for traditional funeral service and burial, cremation, and even green burials so you can decide which is right for your loved one. Plus you can choose a wide selection of caskets, vaults, and urns that come in different designs to suit your particular preference and budget. Recovering after your loss may be a long and difficult process, and many people find that it is comforting to have some help during this time. We provide grief support so you can cope with your loss while also taking care of necessary details following a death, such as processing all the paperwork for social security, insurance, title and deed transfers, credit cards, and more. Our compassionate staff is here to help you through all of these procedures at no cost. Your convenience and peace of mind matter to us. Contact us today to find out more.